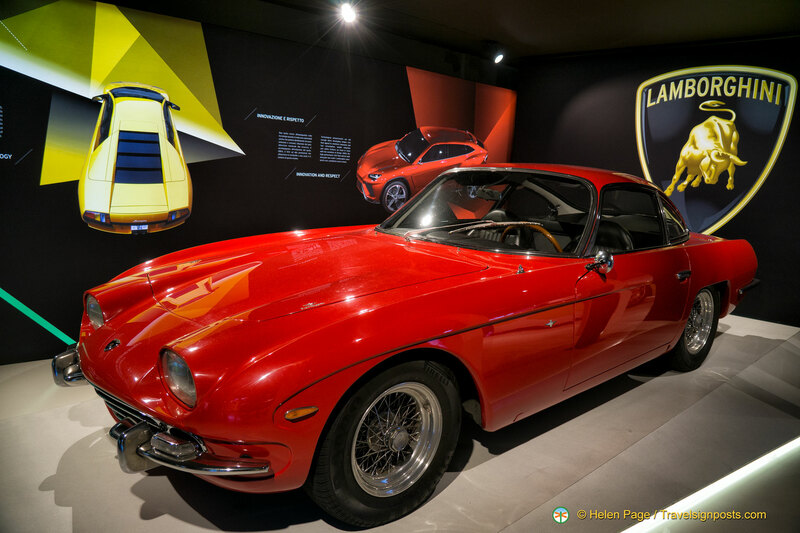 To understand the passion and magic behind the Lamborghini brand, a visit to the Museo Lamborghini is a must-do in Bologna. 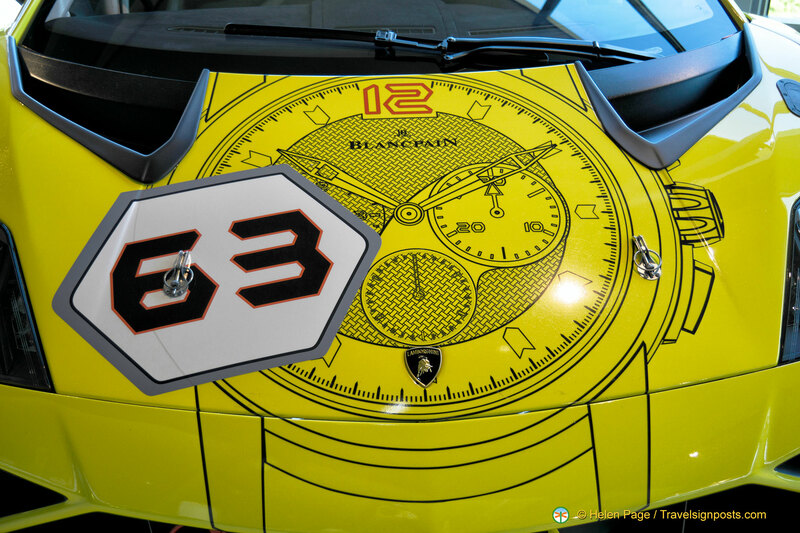 The Lamborghini Museum is home to a lot more than the Miura, the cars are works of art and the stuff of Top Gear dreams! To celebrate the 40th Anniversary of the birth of the legendary Miura, the Centro Stile Lamborghini, under the auspices of William de’ Silva, reinterprets this historical sports car icon, which was presented at the Detroit Auto Show. The distinctive marks of the Miura have been reproduced but its proportions have been slightly modified in favour of an improved aerodynamic dress, an inevitable feature of the modern high-performance sports car. 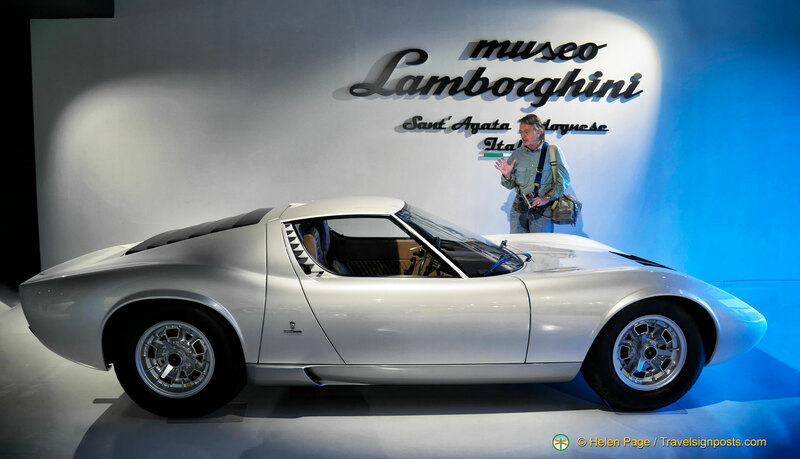 As there were no plans for a series production of this model, the immediate request for a limited series production by Lamborghini fans was never answered. 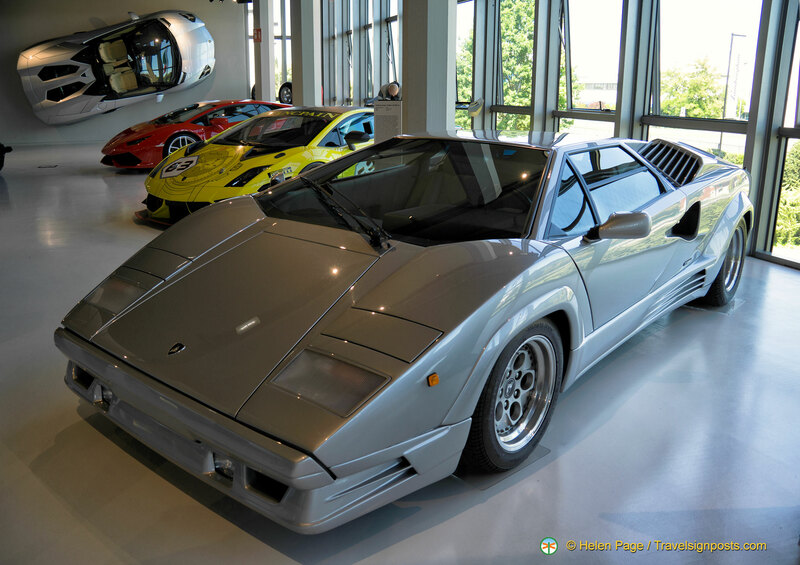 The Lamborghini Museum is divided into two sections. 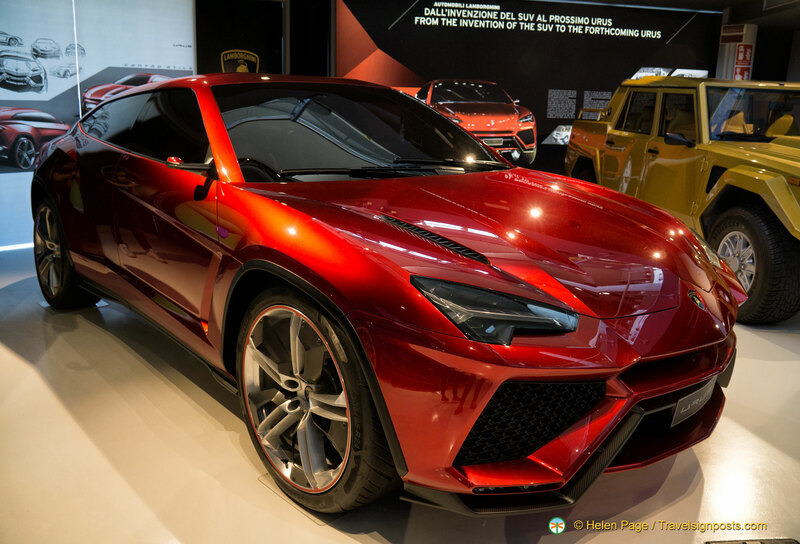 The first is dedicated to the historic models, including, of course, a Miura and Countach, and some more recent models, along with a number of prototypes and concept cars, including the Urus, which gives a pointer to the forms of the upcoming Lamborghini Super SUV set to debut in 2018. A special version of the Countach was produced to celebrate Lamborghini’s 25th Anniversary. This model represented the latest evolution in its long career that originally began in 1974. New front spoilers, modified wheel arches and air vents visibly differentiated this series from previous ones. It was equipped with four-valve engine heads introduced with the Countach QV in 1985. On the 4th July 1990 the last Countach, the one in the photo, left the production line at the same time that the new Diablo began to be produced. Less than two thousand Countachs in all its forms were built, so they’re in short supply! 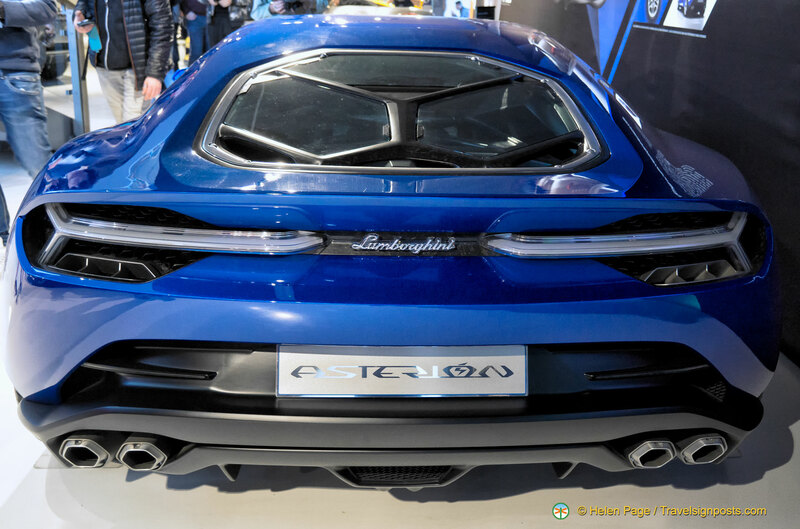 The Lamborghini Asterion is inspired by a legend: Asterion is the proper name of the mythical Minotaur, a hybrid figure and symbolic crossbreed telling a story of the powerful fusion between intellect and instinct, part man and part bull (not many people know that). 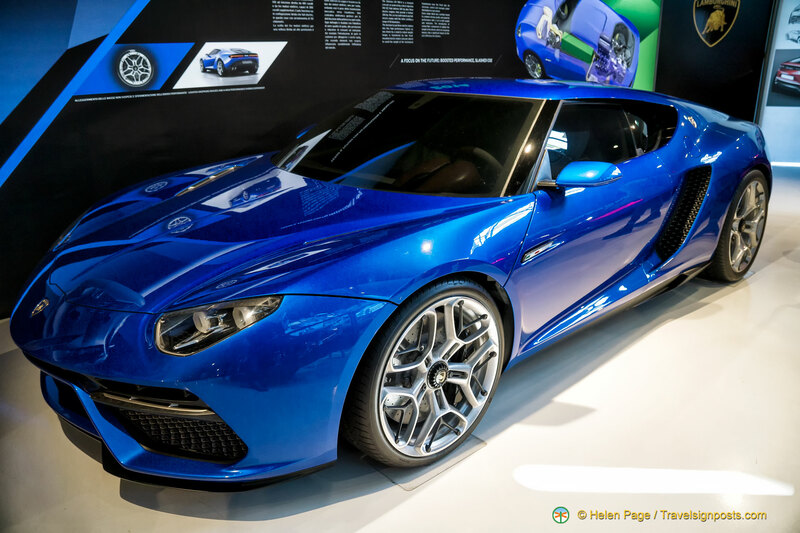 The Asterion’s hybrid architecture has an electric motor incorporating an integrated starter motor and generator (ISG) which is placed between the V10 engine and the double clutch gearbox, with two electric motors at the front axle fed by the ISG power with a torque vectoring function. This system gives the Asterion two different driving modes: in hybrid mode it is combining the V10 engine with the three electric motors, guaranteeing a permanent four-wheel drive without being dependent on the battery’s state of charge. In pure electric drive mode only the two electric motors at the front are used. The Asterion has a top hybrid speed of 320 km/h and reaches 120 km/h under pure electric power. More importantly for city driving, the Asterion has a pure electric range of 50 km, putting it top of the class for hybrid super sports cars. The new Hurucan LP 580-2 is the two-wheel drive version of the Hurucan coupe. It was launched at the Los Angeles Auto Show on 17 November 2015. With a 5.2 lire V10 engine it generates 580 HP and has a top speed of 320 km/h. With this unique technology demonstrator, Lamborghini has redefined the future of super sports cars. With an extremely lightweight construction thanks to advance carbon-fibre technology, the Sesto Elemento has an overall curb weight of only 999 kg, including the V10 power unit and permanent all-wheel drive! 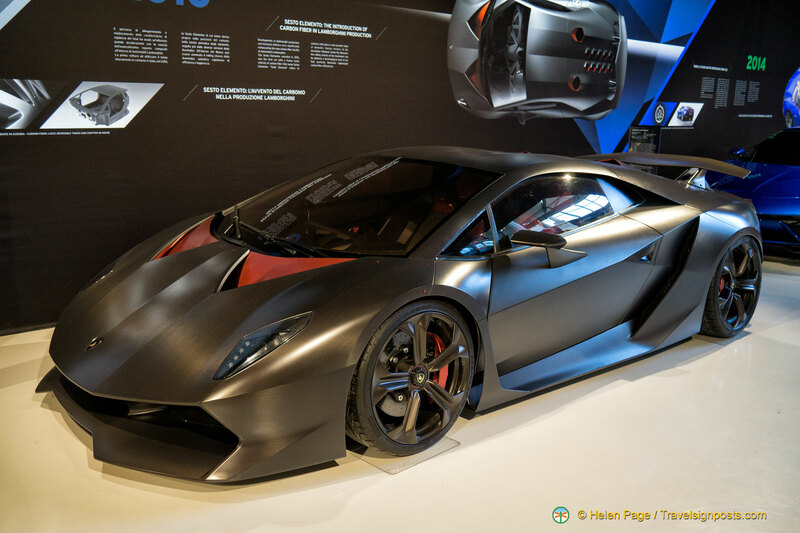 With a sensational power-to-weight ratio of only 1.75 kg per HP and a consequent 0-100 km/h (0-62 mph) of just 2.5 seconds the Sesto Elemento certainly has snap-your-head-back acceleration. What’s more, the pulling power is impressive, with the torque curve peakig at 540 Nm at 6500 rpm. Add to this the car’s razor-sharp handling, voracious turn-in and its huge braking power and you’ve got a pretty stunning package. BTW, “Sesto Elemento” means “sixth element” or, in other words, Carbon. Not a surprising choice, given Lamborghini’s leading expertise in carbon-fibre reinforced plastic (CFRP). Unveiled in Navarra (Spain) during the final round of the 2013 Lamborghini Blancpain Super Trofeo Europe, the Gallardo Super Trofeo LP 570-4 had sophisticated aerodynamics: new rear wing adjustable in 10 positions, front splitter, flat floor, rear diffuser and redesigned front and rear bumpers. This allowed the Gallardo to increase its aerodynamic efficiency by 120% compared to the previous model. New air-ducts to the front discs increase cooling by 50%. In it’s 50th Anniversary year, Lamborghini produced this amazing monster! Its design was focussed on optimum aerodynamics and cornering stability, giving the Veneno the real dynamic experience of a racing prototype, yet it’s still fully homologated for the road. 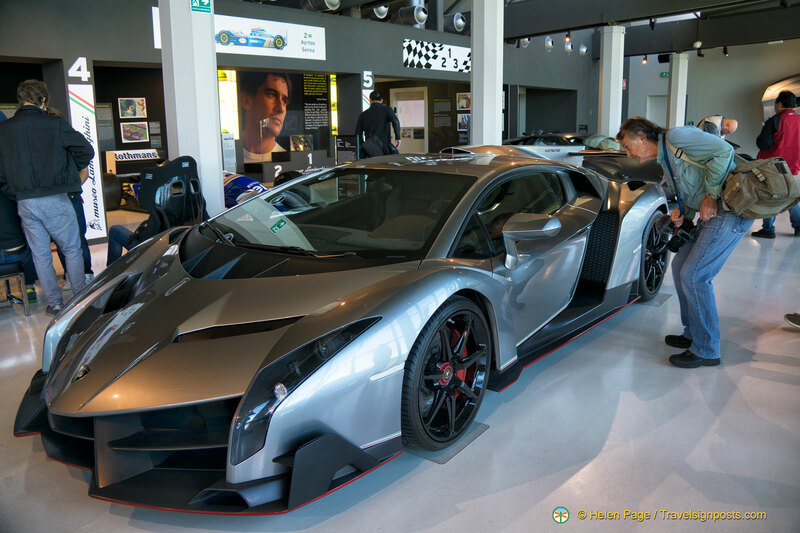 Above all, though, the Veneno benefits from Automobili Lamborghini’s special expertise in the development and execution of carbon fibre materials: the complete chassis is produced as a CFRP monocoque, as is the outer skin of this extreme sports car.The inside also features innovative Lamborghinni patented materials such as Forged Composite and CarbonSkin. BTW, the name “Veneno” comes from a legendary fighting bull, one of the strongest and most aggressive fighting bulls ever. He was also famous for being one of the fastest bulls in the history of bullfighting, and in 1914 fatally wounded the famous torero Josef Sanchez Rodriguez. The Lamborghini SUV concept was developed using leading edge 21st century technologies and skills and has now evolved into the Urus. The car’s technical features have not yet been officially announced, but there is no doubt that specialized materials (alloys and lightweight components) will be used in its construction as this is one of Automobili Lamborghini’s areas of expertise. The facility where it will be manufactured is in Sant’Agata, just behind the historic production plant. The other section is dedicated to theme-based exhibits. When we were there in 2017, there was an exhibition spotlighting the extraordinary life and the great success of Ayrton Senna, documented with photographs by Ercole Colombo and a film on the driver’s life: plenty of the most exciting moments and the final tragic crash coverage proved quite moving. Further on you could see all the race cars driven by the Brazilian champion, from his first kart to the Formula Ford and Formula 3 cars, along with all the Formula One cars. The 350 GT was the first Lamborghini to enter production. The body of the car features several aluminium elements, independent suspension and disc brakes on all four wheels; some models were also equipped with a limited slip differential. By the end of 1966, Carrozeria Touring had produced 120 cars, of which the last ones had a 4 litre engine having the same power as the 3.5 litre V12 but with greater torque. From April 1 to October 31, from 9:30 am to 7:00 pm. From November 1 to March 31, from 9:30 am to 6:00 pm. Guided tours of the Museum are usually available upon request, as a rule during August. 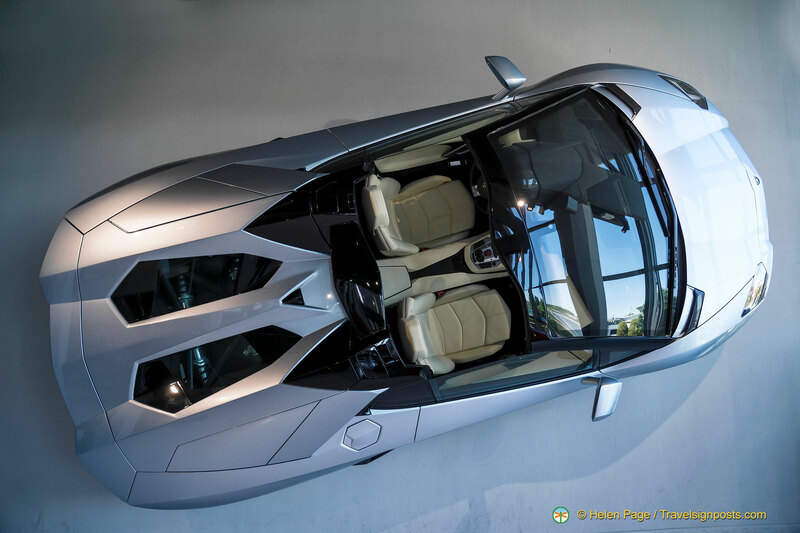 The Lamborghini Museum has no architectural barriers. Visits take place over two floors, and a lift is available for persons with limited mobility. You can also do a factory tour. We didn’t do this, but it’s supposed to be worthwhile, if a little expensive – €75 which includes museum entry. Expensive as it is, the factory tours are very popular and you’ll need to book ahead to guarantee your slot. There is a bus you can take from Bologna to the center of Sant’Agata Bolognese, which is a five minute walk from the museum location. We did this and it’s quite straightforward. The ATB 576 bus (direction Crevalcore) departs from the main bus station in Bologna and takes roughly 50 minutes to get to the “S. Agata Bolognese Chiesa Frati” stop in Sant’Agata Bolognese, which is just five minutes on foot from the museum.